Angel Annie has little Annie of her own. 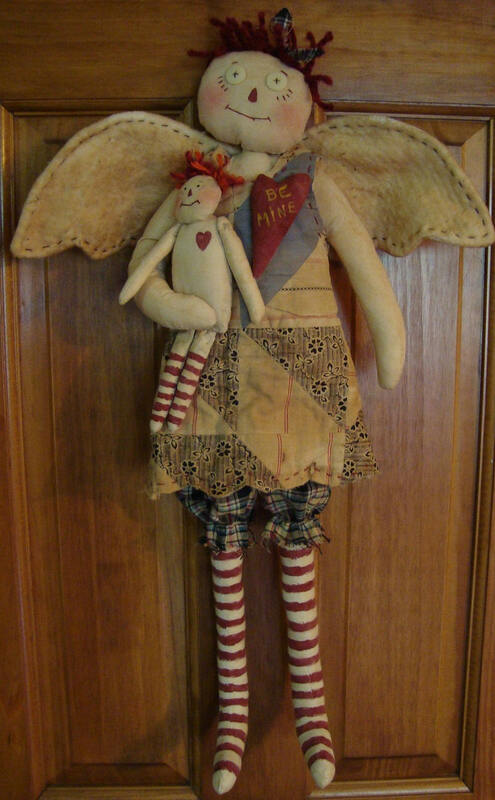 Angel Annie measures 22 1/2" tall, made of cotton which has been gently tea dyed. Her dress is made of an antique quilt with homespun bloomers. Her stockings have been painted with acrylics and gently sanded. Her hair is wool yarn, nose painted with acrylics and other facial features have been embroidered with floss. She hangs with a ribbon; she and her dolly are $65 plus shipping. This is Lesley Lou and her dolly. 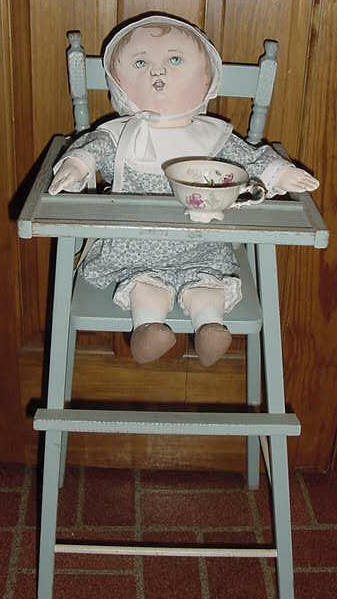 Lesley Lou is 15 1/2" tall, made of cotton and wears cotton bloomers and dress. Her hair is wool roving and has been braided. Lesley Lou's facial features have been embroidered on using floss. She and her dolly are up for adoption for $35 plus travelling fees. 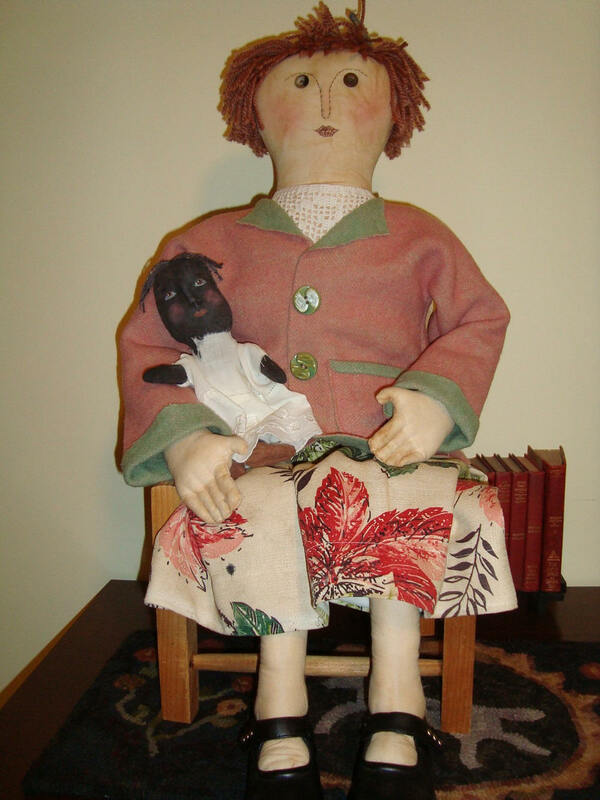 Barbara is 37" tall, made of woven cotton which has been tea dyed; she has a needle-sculpted nose and fingers, stuffed with a combination of fiberfill and rags for weight (like our foremothers used to do for stuffing). Her skirt is vintage fabric and the jacket is made from a reversible wool blanket. Her dickie is a hand crocheted piece ~ clothing not removable. She has button eyes and yarn for hair which was stitched on, her lips are embroidered. 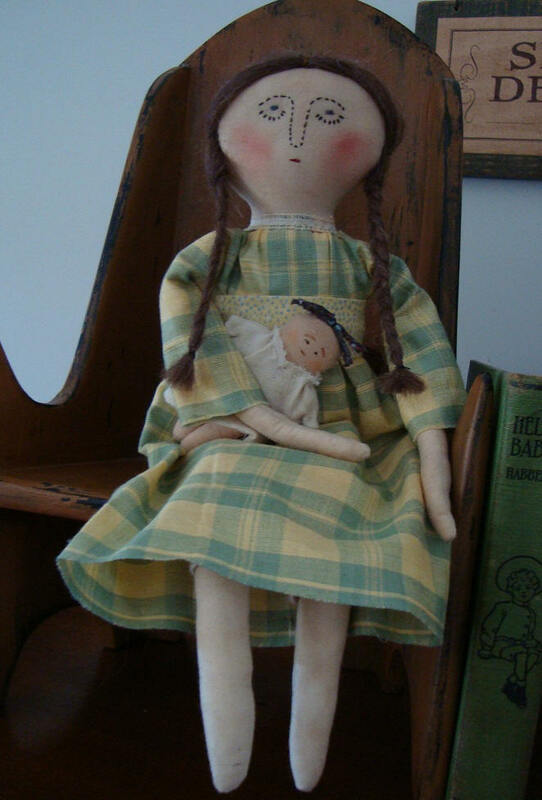 She holds a rag doll which measures 10 1/2". She would be cute in a rocking chair, in a shabby chic room, child's room, Florida room with wicker or just about anywhere. Barbara and her dollie can be yours for $105 plus shipping. Chair not included. Isn't this baby Annie adorable? She measures 15" from top of head to bottom of dress. Annie has a ribbon on the back for hanging on the wall or she can sit. You could also cradle her in a grapevine wreath as I've shown here. Annie's body is premium cotton muslin, her dress is cream flannel with 3 small buttons on the bodice. Her face is a combination of pigma pen and acrylic paints. 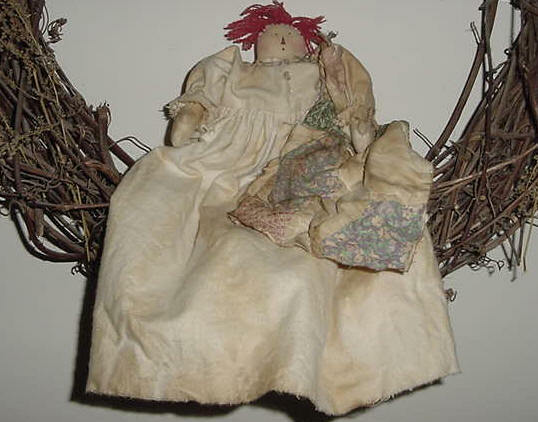 The doll, clothing and scrap quilt piece have been tea dyed to give a vintage appeal. $38 plus shipping. Megan is made using quality canvas, so will endure lots of wear over the years. She is coated with two layers of a gesso/modeling paste mixture, sanded between applications and painted with oils. Tho hard to see in the picture, she has two front teeth, stitched fingers and pastel blue socks with painted on shoes with a bow. The bonnet, collar and cuffs are embellished with a running stitch using DMC perle cotton. Megan is 19 1/2" tall, there are no small parts which makes her a wonderful heirloom gift. Megan (a Susan Fosnot design) is $95 + shipping. Chair and cup not included. I remember Annie, but this Annie's face is done with traditional rug hooking techniques as was done by our foremothers when they made bed rugs and hooked rugs. She is hooked using wool felt as well as her arms and legs. 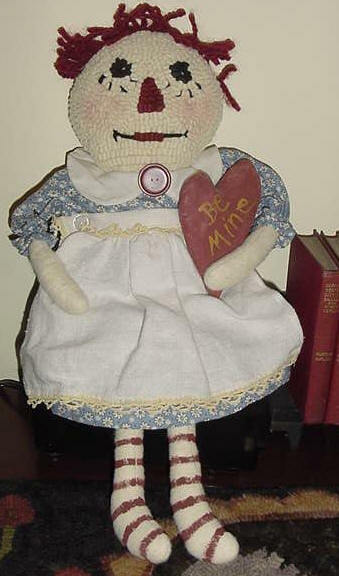 Annie is 19" tall, wears knit stripe socks, an old doily apron and holds a painted muslin heart. 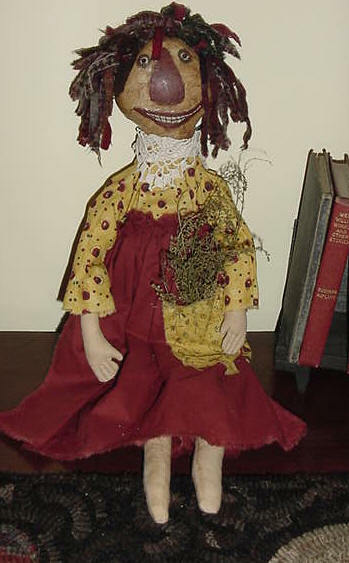 Yarn hair and vintage button finish this collectible Raggedy Annie. Althea is made of woven cotton which has been tea dyed to soften the appearance of the fabric. Her nose is needle sculpted, facial features are embroidery floss and hair wool roving. 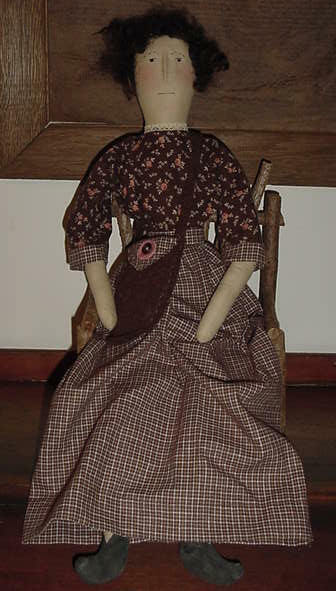 She measures 23" tall and wears coordinating homespun skirt and shirt. She carries a purse and has painted shoes. Yours for $45 plus shipping. Sweet Annie measures 21 1/2" tall, her head is a combination of fabric with layers of tissue appliquéd, painted and then a couple layers of matte sealer applied. Her body is made using fabric and stuffed with fiberfill. Sweet Annie's hair is made of wool strips for a primitive look, and she derived her name by having a bouquet of Sweet Annie in her apron pocket. She can either sit or hang with the ribbon hanger on her back. Yours for $45 plus shipping. Stone Angel ~ her head is sculpted clay with a body, wings and clothing made of quality woven cotton, with lace at the neckline. The clothing is stiffened with an acrylic paint mixture to resemble a Stone Angel Statue. She stands 25 1/2" tall, has well formed fingers and toes. Propped in her hands is painted cardboard with sheet music on the other side. Stone Angel is meant to be an inside work of art that would look lovely in a garden bath area, a sunroom with plants, or even as a center piece for holidays. During the Christmas season you could remove the sheet music and drape a garland of dried cranberries over her arms and vintage tinsel garland halo. Or Easter you could put vintage post cards between her thumbs and fingers. Take a look at this same angel in my Christmas page to see it as a table center piece. Stone Angel may be yours for $65 plus shipping. This item has sold. Please check back often to see what new items may be listed. This item sold, please check back later for more dolls.